The Jay Street Terminal / Connecting Railroad was located on both sides of as well as ran under the Manhattan Bridge and its immediate vicinity. It was the last Offline Rail-Marine Terminal to be organized in Brooklyn on February 5, 1906 (with Palmer's Dock organized in 1876, New York Dock in 1901 and Bush Terminal in 1905). Keep in mind, the we are discussing the rail operations as John Arbuckle established his coffee refinery and associated warehousing prior to this. It was also the smallest of the Offline Rail-Marine Terminals in Brooklyn and it would be the first to cease operations in 1959. However, the Jay Street Connecting was the most eclectic in terms of equipment. 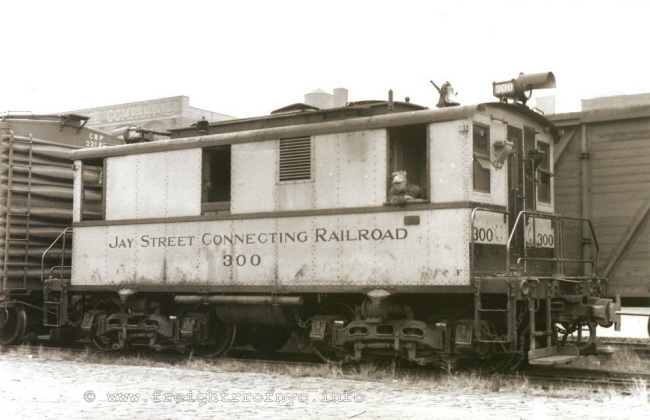 Initial history is very vague, but the original Jay Street Connecting Railroad was formed in 1906, but was not incorporated until October 9, 1909. Obviously from referencing various government documents and locomotive builders records, the railroad was operating several years by this time. 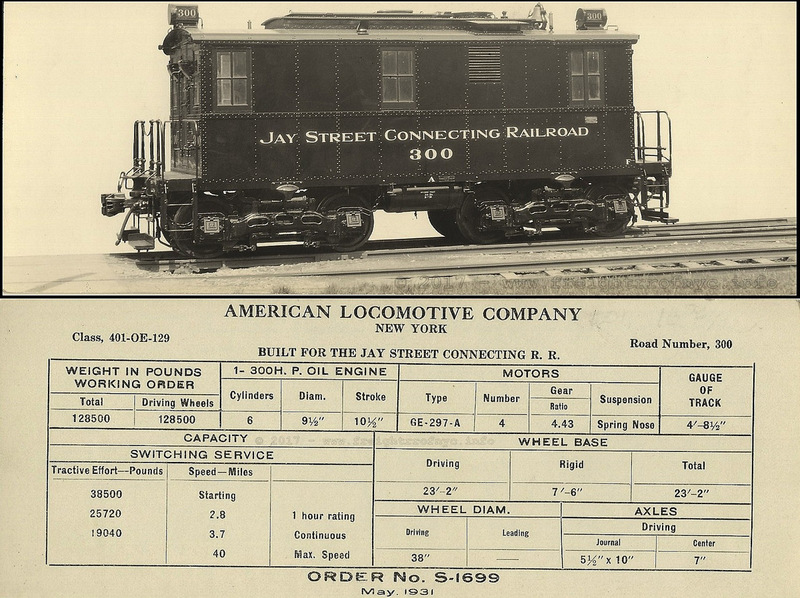 A second railroad known as the Jay Street Extension Railroad Corporation was incorporated on January 8, 1916. Very shortly after that, the original Jay Street Connecting Railroad was consolidated with this newer Jay Street Extension Railroad, with the new entity being called Jay Street Connecting Railroad and being incorporated on April 3, 1916. Both of these railroads would be owned by the parent corporation "The Jay Street Terminal". It is presumed by reading the details in the Public Service Commission Abstract Report of 1917 at below right that all this consolidation and reincorporation was due to the original contract needing to be voided because the railroad failed to construct certain trackage and rerouting other trackage in an agreement with the City of New York. 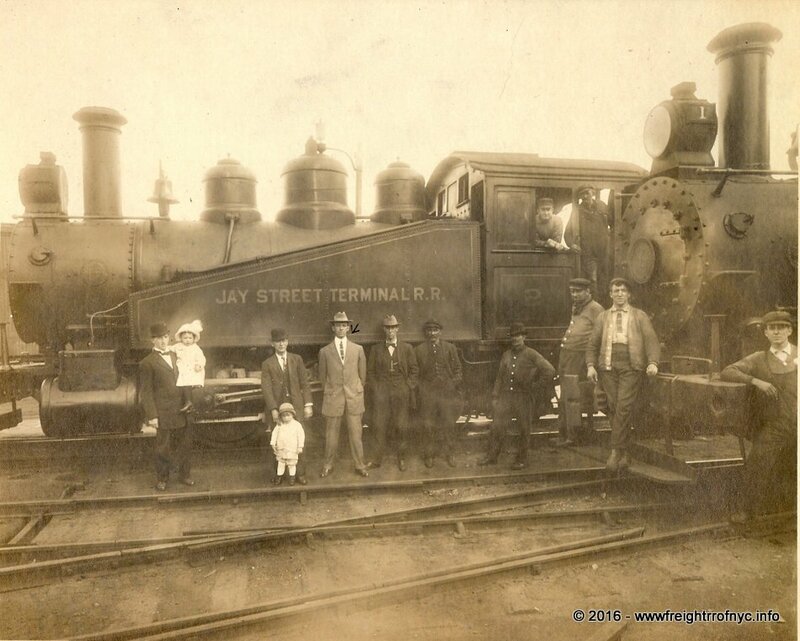 The Jay Street Terminal and likewise the railroad(s) was owned by John Arbuckle (b. July 11, 1839 in Alleghany City, PA - d. March 27, 1912) and William A. Jamison. The history of the Arbuckle Brothers predates their relocation to New York, but for reasons of clarity I have only concentrated on their history after their arrival in New York. The Arbuckle Brothers: John & Charles [d. 1890]; first organized their company in New York City in 1871. Their primary commodity was coffee, being imported by the Arbuckle Brothers for their name brand: "Ariosa". This brand of coffee would become famous worldwide, and very desired among the cowboys in the Western US. The Arbuckle Brothers ran into some tribulations when Henry Havemeyer (of Palmers Dock / East River Terminal / Brooklyn Eastern District Terminal as well as Havemeyer & Elder Sugar Refining history) began raising prices of refined sugar being purchased by the Arbuckle's. One thing led to another including some bad blood, so the Arbuckle's built their own sugar refinery in 1897. To build the refinery, they hired Joseph Stillman (a former employee of the Havemeyer's) who at that time was the leading expert in sugar refining. The refinery opened in 1899, much to the chagrin of Henry Havemeyer. To exact revenge, Havemeyer entered the coffee business and for quite some time, there would be a price war on coffee with both parties lowering prices to outsell the other brand. Each party spent about 12,500,000 dollars fighting the other in legal fees and other incidentals. Eventually both Arbuckle and Havemeyer would wind up selling their coffee for less than cost. In 1901, Arbuckle and Havemeyer had a "sit down" and ended their feud and sugar and coffee prices went back up. With that "competition" problem solved, Arbuckle entered the tugboat monopoly on the Hudson River. The impetus for Arbuckle entering the tugboat / towing field was that he thought that the going rate of $50 for a barge to be towed from New York City to Albany was too steep, so Arbuckle entered the market. Within a short time the towing charges dropped to $5! In 1905, the Arbuckle firm introduced a new coffee brand named "Yuban". 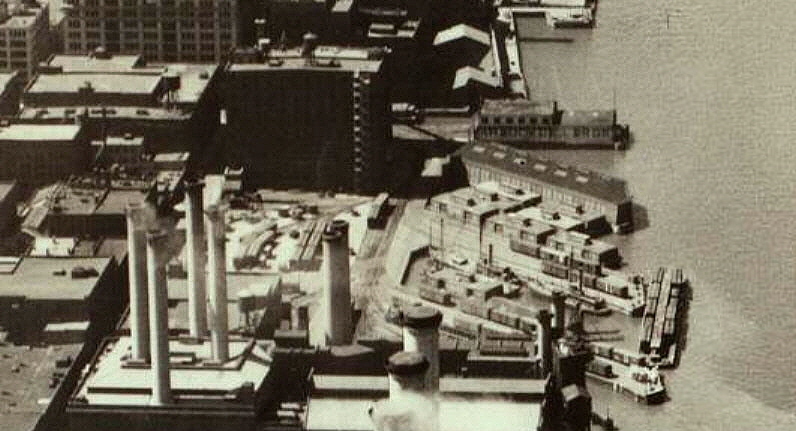 The Jay Street Connecting Railroad / Jay Street Terminal, for all intents did not have vast property holdings, as did Brooklyn Eastern District Terminal, New York Dock or Bush Terminal; and the Jay Street Terminal did not have a great many buildings to call their own (keeping in mind that Arbuckles Coffee Warehouses were a separate entity). "...within the said lighterage limits is the Jay Street terminal. 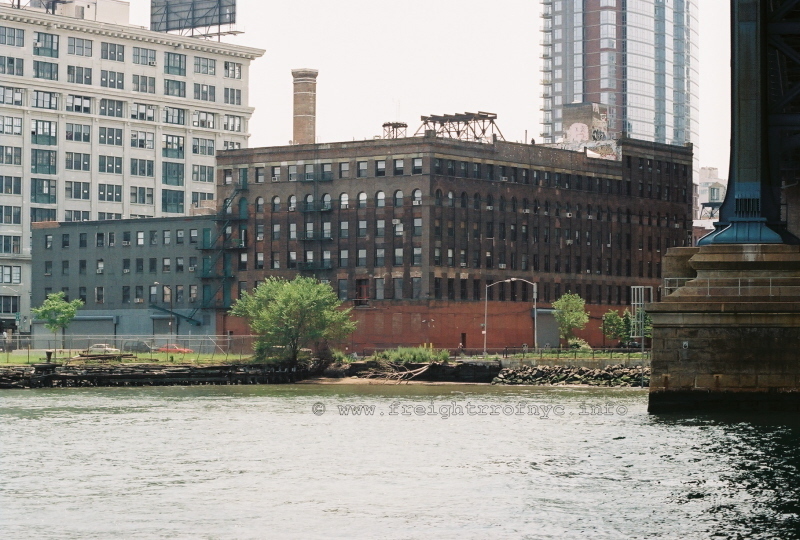 This terminal is located at the foot of Bridge street, Brooklyn, on the East River, having a water frontage of 1,200 feet and a depth of 600 feet. Its equipment consists of a large freighthouse, two Baldwin locomotives, three tugboats, two steam lighters, eleven barges, nine carfloats. The capacity of the yard is about 235 cars. The Jay Street terminal is a union freight terminal for all said petitioners, and is designated as a regular public freight terminal of petitioners in their tariffs filed with the Interstate Commerce Commission. 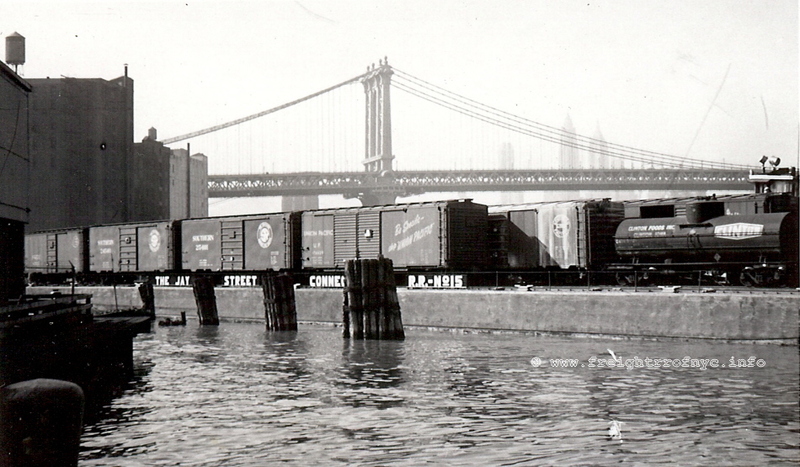 It is owed by a copartnership composed of William A. Jamison and John Arbuckle, conducting such freight terminal as a separate business under the name and style of "Jay Street Terminal," under certificate filed with the clerk of New York county in accordance with the law of the state of New York, and is operated as a freight station for petitioners under and pursuant to several contracts between petitioners and the Jay Street Terminal, which contracts are substantially identical in their terms and provisions. The initial property holdings consisted of land between Adams Street through Hudson Avenue west of John Street and would consist of three piers, a float bridge, enginehouse and team yard. 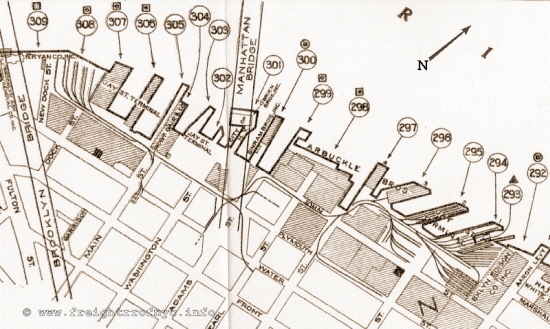 In 1911, the Jay Street Terminal acquired additional property between Catherine Ferry landing (now Main Street) and the Fulton Ferry landing (now Cadman Plaza West) via purchase from the New York Dock Co. It was proposed at that time, that the Jay Street Terminal would expand and put in additional float bridges, new piers, etc. You can read the pertinent details of this acquisition in the October 14, 1911 article from The New York Times at left and right. Most importantly, this acquisition procured for them several warehouses, giving them some storage capability, however limited. "The Jay Street Terminal is the fourth of the private terminals on the Brooklyn water front. This terminal is operated by a partnership whose members are identified with the Arbuckle Brothers. sugar refinery and coffee mills. This terminal, which was opened to the public in 1905, is located on the East River just north of the Brooklyn Bridge and occupies an area of about 200,000 square feet. The property of the Jay Street Terminal includes six piers. Three of the piers, with a ground area of 66,788 square feet and a shedded area 60,648 square feet, as well as several warehouses, with a total floor area of 440,800 square feet, were acquired from the New York Dock in 1911. Two of the piers are open, while one has a shed with an area of about 7,000 square feet. The Jay Street Terminal is equipped with locomotives, lighters, and other equipment for the interchange of freight with the trunkline railroads. It has a yard capacity of 250 cars and it's equipment includes a gantry crane of 20 tons capacity for handling heavy machinery and other bulk freight." After John Arbuckle passed away in 1912, his nephew William A. Jamison took control of the Arbuckle Brothers properties, including the Jay Street Terminal. The Arbuckle Brothers Company would expand into several fields including groceries and sundries, as well as the shipping and receiving of commodities through the Terminal. In 1917, the Arbuckle Brothers would build an eleven story coffee and sugar warehouse at Jay, Main & Plymouth Streets. 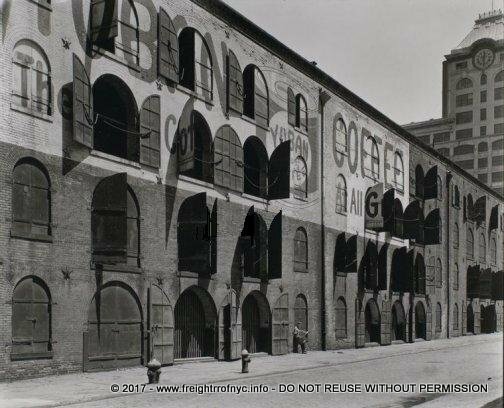 This building was constructed with nine railroad sidings inside on the ground floor (similar in function to the Austin Nichols building, as constructed by Havemeyer & Elder at the Brooklyn Eastern District Terminal).. In the 1924 Fairchild Aerial Survey Photo above, located and submitted by Joe Roborecky; we can see several interesting details of the yard facilities of the Jay Street Connecting Railroad / Jay Street Terminal. Please keep in mind that in this photo, north is right and east is down. Starting towards the top of the photo and along the bulkhead, we can see one of the freighthouses on the pier (perpendicular to the bulkhead) marked for "Arbuckle Brothers". Between the southernmost diagonal piershed / pier and the pier yard, we see seven covered barges moored in the slip. All appear to have their doors closed, and all appear to have cupolas on the roofs. These cupolas are most unique as most railroad covered barges had flat roofs. In the next slip east (down) we see two steamers. These two steamers are believed to be the Jay Street steam lighters "John Wise" and the "Santos". 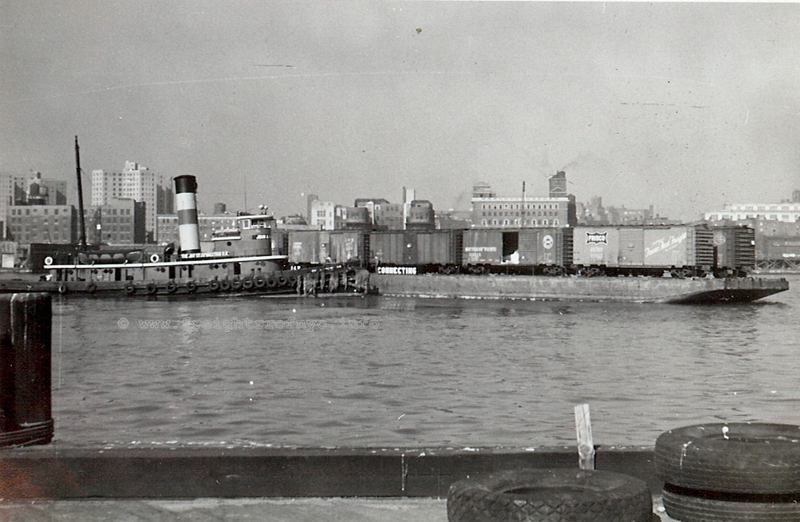 Another covered barge, this one with its doors open, is moored to the pier below the steamers, and between the steamers and the covered barge, appears to be a short three track interchange carfloat. Blocking this slip at the end of the pier is a loaded station carfloat. The next pier north contains another railyard which is partially obscured by the smokestacks. To the right of the topmost large smokestack (which appears to be capped, as well as its northern sibling!) we can make out one side of the float bridge which appears to be a pony plate girder. 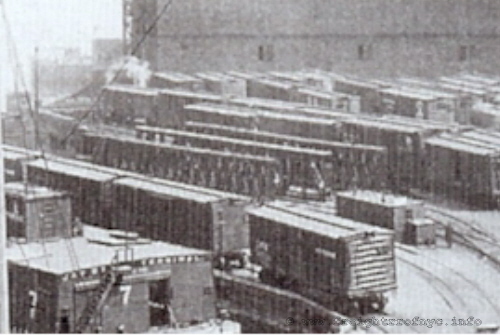 In the railyard east of the piers, we can see two trucks next to the group of five boxcars on the left and between those five boxcars and the six boxcars on the right. What are not seen, is any discernible locomotives. The following table and information, was compiled by Michael Smith of the Rail-Marine Information Group for Tom Flagg's article in Transfer Issue #44 (January - December 2006). It reports the the annual freight cars handled and persons employed at the Jay Street Terminal for the years listed. The Jay Street Terminal, on average, handled thirty three to seventy five freight cars per day over the above listed time period. The Wyer Report of 1944 states that the Jay Street Terminal handled 430,701 tons of freight in 1942, or about 1,180 tons per day. That translates to an average of 29½ forty ton boxcars handled per day (using a standard 40 foot steel boxcar common to that period). But keep in mind open gondolas containing oversize freight and hoppers of coal was also handled by the Jay Street Terminal as well. 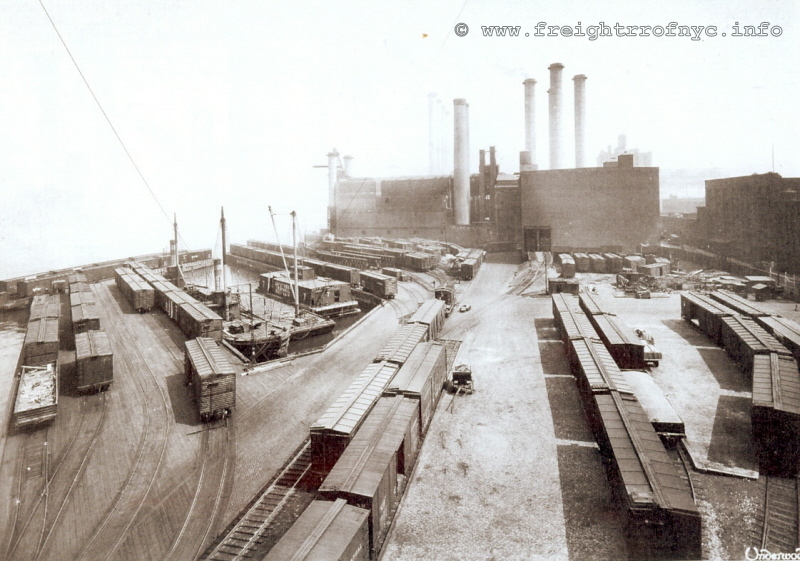 Approximately 10% of this traffic was Less Than Carload Lot (LCL) freight, which confirms prior information that the Jay Street Terminal operation was primarily full carload consignments for the industries served by the railroad. Unfortunately on August 5, 1958, with mounting debt and dwindling income, the Jay Street Connecting Railroad was notified by the trunk line railroads that no more credit would be extended to it. On or about the same day, the Jay Street Connecting Railroad tugboat (John A. McCormick?) met with an accident and ruled unfit by the Coast Guard, and thereby would necessitate the rental of another tug, if operations were to continue. According to documents, the railroad was operating at a loss for the previous five years, and due to the lack of operating funds (apparently the the Jay Street Terminal had only $400 in liquid assets at this time), it could not repair the McCormick or even rent another tug. Therefore, to prevent an accumulation of freight cars; a decision was made to embargo all freight, incoming and outgoing. On August 6, the customers were notified of this embargo which would become effective at midnight, August 8, 1958. At this same time, the railroad notified its employees that their service would not be needed after that date as well. The customers of Jay Street Connecting Railroad took this embargo to mean an actual abandonment (which was in fact what it really was), and therefore filed the injunction. The railroad naturally filed an appeal, citing its cash poor state, and of which it won that appeal. 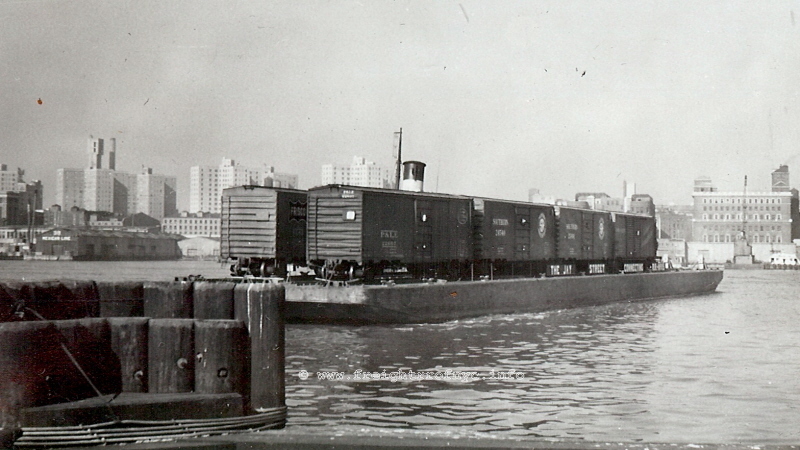 As inferred however by the abandonment papers of 1958, the Jay Street Connecting Railroad / Jay Street Terminal instead of storing freight in warehouses or depots, delivered the cargo straight from carfloat to customer. Therefore, according to this document there was no longer a "public" terminal located at Jay Street Connecting Railroad / Jay Street Terminal and freight was handled by the full carload only. You can view and read these filings in the above Overview chapter. 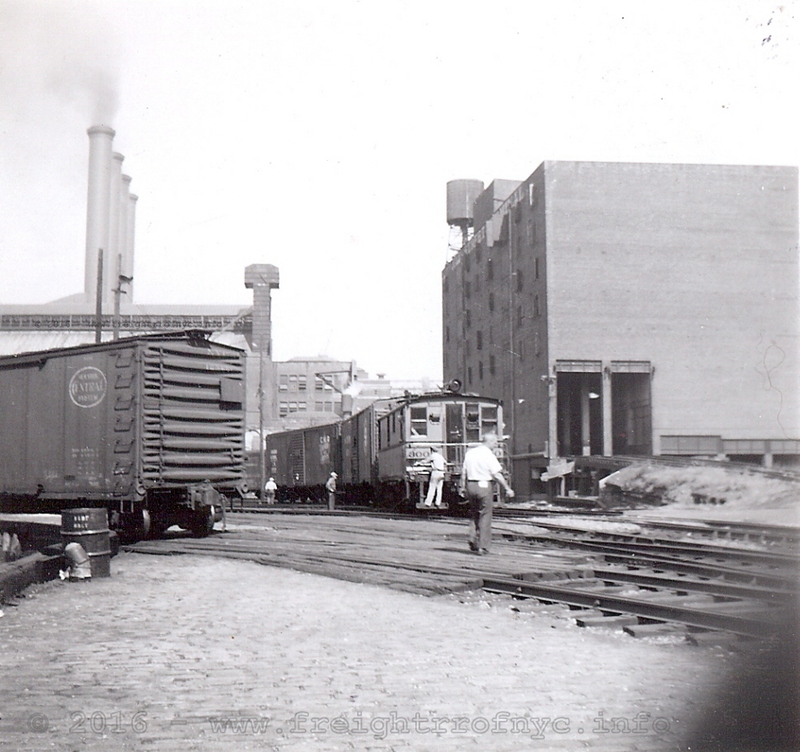 So all things being said, the Jay Street Connecting Railroad / Jay Street Terminal had a small freight yard off its single float bridge for assembling strings of cars for outbound car floating, but for the most part in the later years; incoming cars were brought directly to the customers structure located on spurs and sidings. 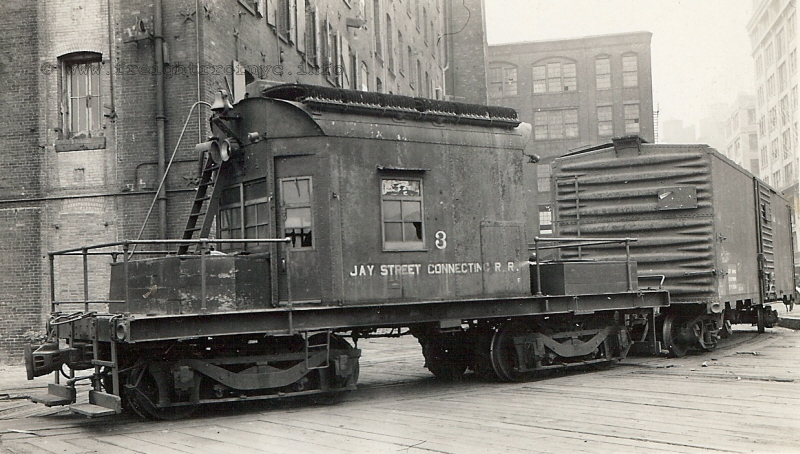 This limited method of delivery, and no longer having the capacity for LCL (Less than Car Load) storage, was apparently one of the factors stacked against the survival of the Jay Street Connecting Railroad / Jay Street Terminal. In addition to that, there was no room for the Jay Street Terminal to expand along the waterfront for it to even compete with the other independent rail-marine contract terminals located in Brooklyn: Brooklyn Eastern District Terminal, New York Dock or Bush Terminal. Matter of fact, in one of several appeals filed on behalf of the owners of the Jay Street Terminal, it was revealed that the Jay Street Terminal yard property had already been sold to Consolidated Edison (a utility company) for $1,300,000. The contract for this sale was dated July 29, 1958, seven days before the the owners announced their intention to embargo. Furthermore, the closing of title was contingent upon removal of the float bridge. The actual end of the Jay Street Connecting did not come as swiftly as its owners would have liked however. Between appeals, protests and legal actions; it would be almost a full year before the Jay Street operation could close its doors. 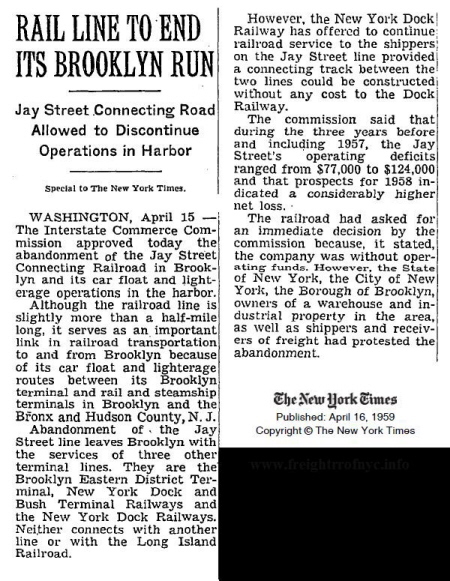 As evidence by the New York Times article to the right, even New York Dock Railway got into the fracas by offering to continue rail service to the soon to be former Jay Street customers, but only if a connecting track could be built at no cost to New York Dock. This would not have been a great deal physically to install a rail connection, as New York Dock was only a few blocks south. Logistically and legally it would be very labor intensive as certificates of convenience were required to be filed and approved by the Bureau of Franchise for freight trains to run within City of New York streets and thoroughfares to say the least. The Jay Street Connecting Railroad and the Jay Street Terminal would continue to operate until June 27, 1959; when it was finally shut down by the owners. It would be the first of the independent "contract" terminals in Brooklyn to close its doors. 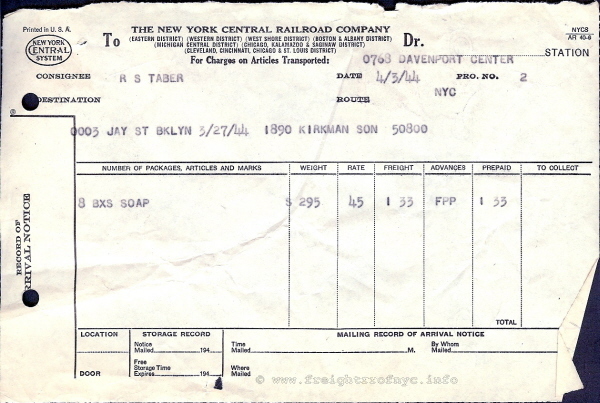 A freight receipt in the Memorabilia Chapter below, shows eight boxes of soap being shipped from Kirkman & Sons to the Taber farm in Davenport Center, NY on April 3, 1944 via the Jay Street Terminal and the New York Central Railroad. Another of the businesses utilizing Jay Street Terminal was E. W. Bliss; and they had a very unique place in the history of Jay Street operations and is worth mentioning. Eliphalet Williams Bliss (b. April 12, 1836 - d. July 21, 1903) began his business interests in two fields: as a press & die manufacturer, and a significant torpedo / munitions manufacturer doing contract work for the United States Navy. The Bliss Company operated its torpedo manufacturing at the Brooklyn plant at Bush Terminal from the late 1800's until at least 1925. In 1903, when Eliphalet passed away, the Bliss Company consisted of a total of eighty-five blocks in Brooklyn, and employed a total of 13,000 people, between the press & die, precision equipment, foundry and the torpedo manufacturing divisions. The aerial image seen at right, shows the individual inner "gunpowder"
structure and outer "assembly" structure. of Engineers Port Facilities Map in the "Trackage chapter below. Torpedoes were manufactured at the Brooklyn plant, and then transported via the Long Island Railroad to Sag Harbor for testing, where the Bliss Company had a testing site for its torpedoes. Once there, the torpedoes were transferred to Navy vessels that were awaiting supplies or possible return to the war zone. It is unconfirmed at this time, but highly likely; that the torpedoes were loaded onto freight cars on the E. W. Bliss rail siding, and those cars subsequently were loaded onto carfloats by the the Jay Street Connecting Railroad (just across the street). The carfloats would be transported to the Long Island Railroad float bridges in Long Island City. 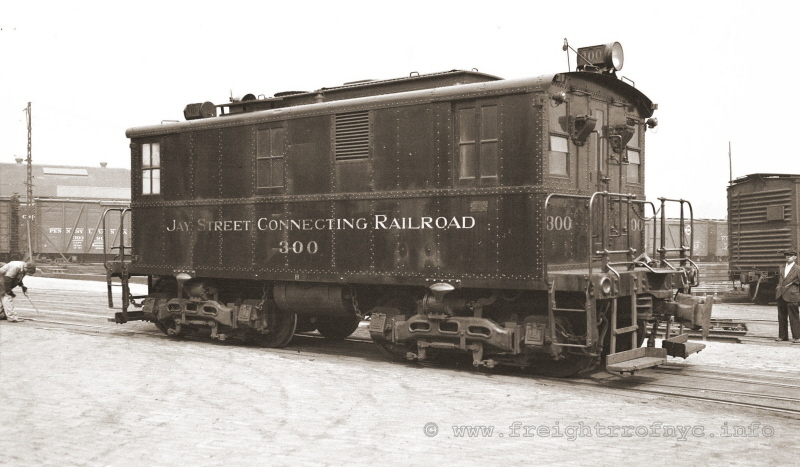 We also know from builders records that E. W. Bliss purchased a Whitcomb 45DE27A model locomotive, c/n 60111 in January 1942; and we know that E. W. Bliss was equipped with a rail siding connecting to the Jay Street Connecting Railroad. Therefore it is very likely, the torpedoes were shipped by rail, originating at the Jay Street Terminal yard. 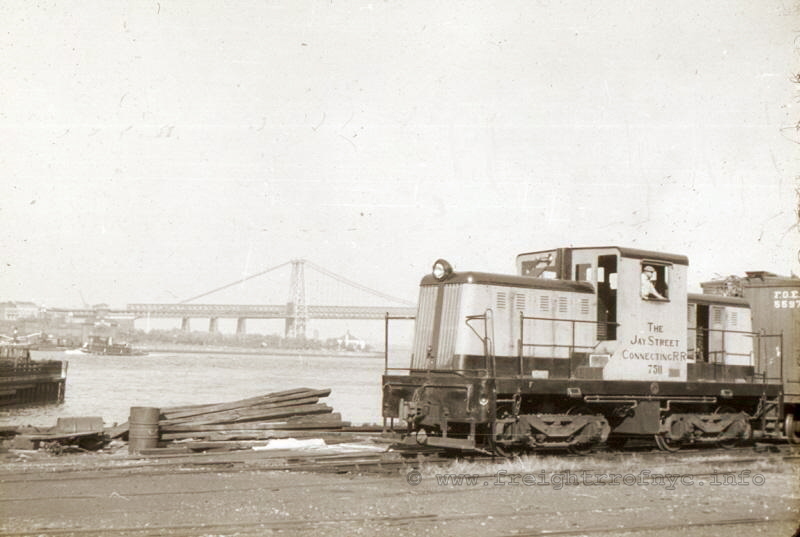 What is not clear, is whether this E. W. Bliss locomotive was used in Brooklyn, or at the facility in Sag Harbor. The E. W. Bliss foundry was located on Water Street. Before his death, E. W. Bliss was also vice-president of the Brooklyn Heights Railroad. The Jay Street Connecting Railroad would come to have the majority of its trackage on city streets both between the Brooklyn and Manhattan Bridges (now known as DUMBO - Down Under Manhattan Bridge Overpass) as well as north of the Manhattan Bridge (Vinegar Hill). The track layout of the Jay Street Connecting Railroad can be viewed in the Army Corp of Engineers "Port Facilities" map below. Most of track with the exception of the yards, was single track through city streets, with spurs into buildings and lofts. At its peak of operations; the Jay Street Connecting Railroad had a capacity of 120 cars (car capacities based on a standard 40' boxcar) and a single float bridge at the foot of Bridge Street. 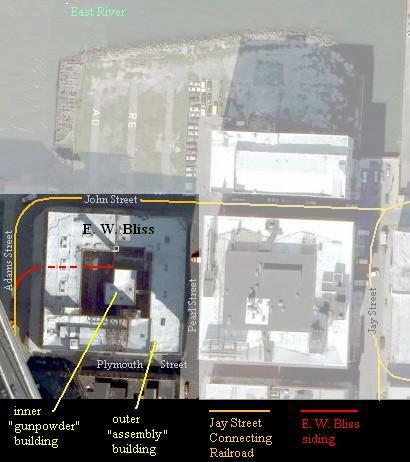 The main railyard and facility was located at between Jay & Gold Streets and between John Street and the East River bulkhead. The open piers and float bridge were located at this yard and are indicated by key numbers 293, 294, 295 and 296 in the Army Corp of Engineers Port Facilities Map seen below. The following image is generously provided from the collection of Tom Flagg. Click on the image below for an enlargement suitable for in depth examination, and a second copy containing notations. Please note: use the back arrow on your browser to return you here. In the photo above, we see a slightly unusual track arrangement leading into the Terminal Building. The two left most tracks ascend up a small incline to service the second floor of this warehouse. As unusual as this may be, Bush Terminal had a similar set up for one their buildings as well. 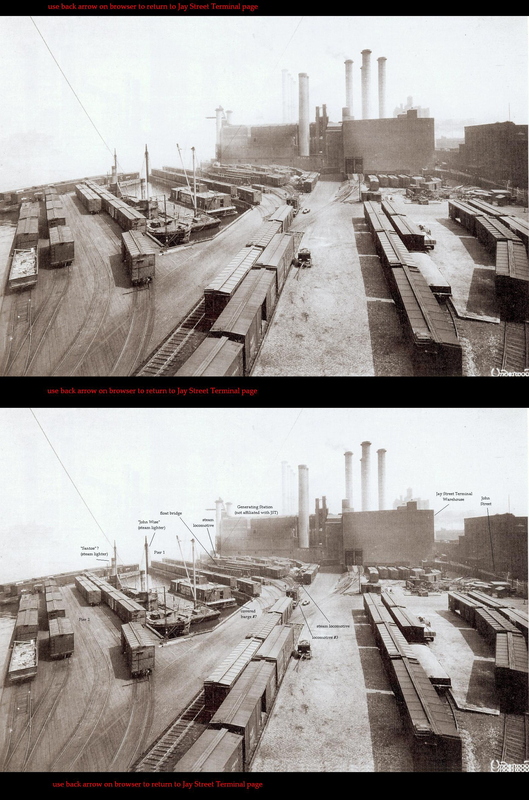 Another unusual facet of the Jay Street Terminal operation, can be seen in both the 1924 Fairchild Aerial and the 1929 Underwood photos. Jay Street had a habit of blocking their slips with carfloats. Note the carfloats moored perpendicular to the end of Pier 3 in both photos, which is essentially entrapping the marine equipment within that slip. In 1941, Arbuckle / Jamison sold the Jay Street Terminal (piers / warehouse) operation to Moses Spatt and Joseph Wohl, who operated under the entity "Famous Realty". In 1945, Famous Realty would acquire all of the stock of the Jay Street Connecting Railroad as well as acquire the lease rights to operate the Jay Street Connecting Railroad trackage from the private owners of the sidings and spurs as well as the main line track from the City of New York. The following images, were contained in the 1944 "Wyer Report". This report was commission by the heirs of the Arbuckle estate in an attempt to raise interest for the prospective sale of the properties. On Plymouth Street looking west with Main Street intersection at the end of second boxcar. Note tower of Brooklyn Bridge in background. Looking east - track at bottom leads onto John Street. Note the "Yuban" sign on roof of warehouse. from left to right: freight transfer platform, team tracks, 40 ton overhead gantry and Pier 3 "Columbian Line". A 10 Ton overhead gantry is hidden behind the Pier 3 structure. and believed to be the firm of N. Ryan Company. 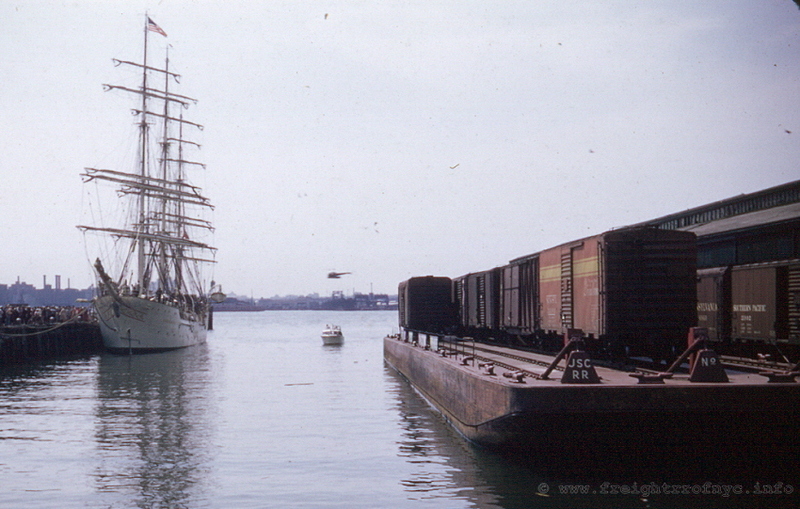 The smaller or west railyard was located between New Dock Street and Dock Street on the bulkhead. 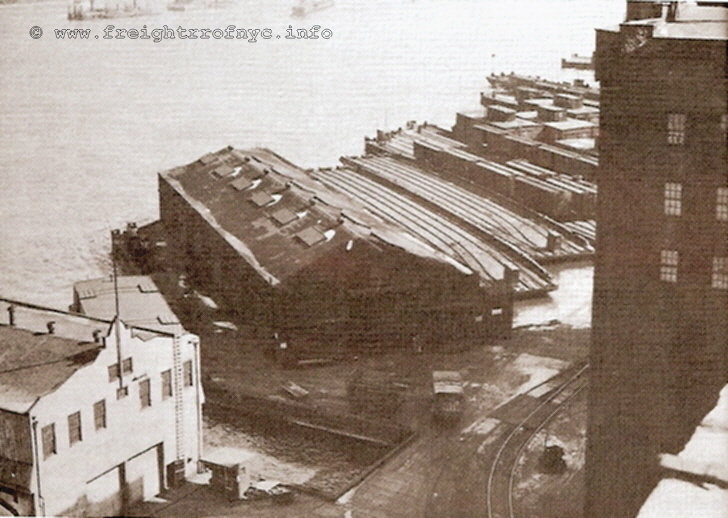 This yard housed the 40 Ton and 10 Ton capacity overhead gantries for oversize loads as well as a freight platform, and is denoted as key number 308 in the Army Corp of Engineers Port Facilities Map seen immediately below. The following track plan, which is from the 1944 Wyer Report, is much more detailed, and contains many notations pertaining to the occupants of the structures and businesses located along the Jay Street Connecting Railroad trackage. Please click on the image below to see a large scale image. Use the back arrow on your browser to return you here. Ironically, most of Jay Street Connecting Railroad's street trackage (girder rail) remains in place, still set in the original sett pavers (Belgian Block), with the exception of the floatbridge team tracks, main yard and engine house. A ConEd power plant and electrical switching yard now occupies this site. The capacities of Jay Street Terminal in 1912 were located in the "Report of the Committee on Terminals and Transportation of the New York State Food Investigating Commission" published 1913; are as follows. Please note this table differs from those of the Bush Terminal and New York Dock, in the fact that the Jay Street Terminal did not exist in 1903, therefore those entries are blank. 1 = Includes delivery track capacity. In 1920, trackage was laid along Plymouth Street and fanned out to seven tracks to service the Arbuckle warehouses, as well as many private customers. As previously stated, freight cars would be brought directly off carfloats and would be spotted (placed) directly at warehouse locations for loading and unloading. The mainstay of the freight traffic would be Arbuckles Coffee, but this would be supplanted with other car load freight to and from the area. Trackage to this date, extended just east of Jay Street and ran into the northwest corner of a building. By 1929, trackage had been expanded greatly and the main track of the Jay Street Connecting still ran primarily down Plymouth Street with turnouts for other streets and building accesses. However, the end termini of the railroad was now located at Dock Street on the west end and the main yard between Bridge and Duffield Streets on the bulkhead of the East River on the east end. 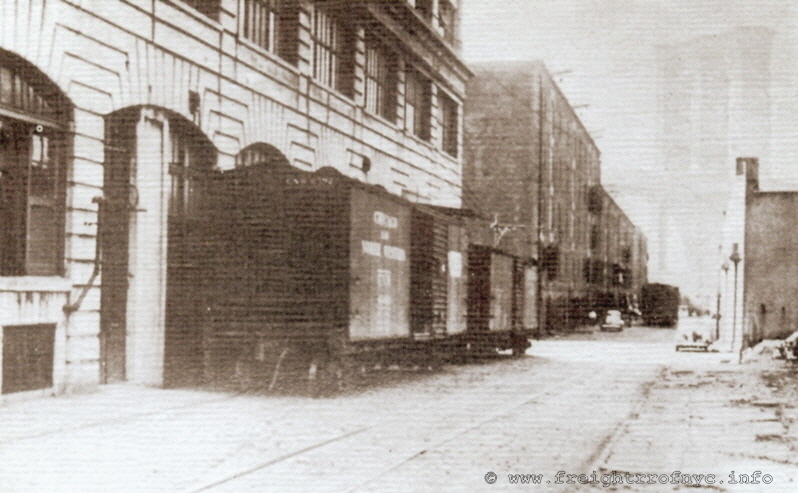 The tracks, which were primarily "girder rail", (identical to that type of rail used in trolley track which are also set in pavement) were set in cobblestone paved streets, (more properly called "setts") of which many sidings branched off the "mainline" which lead into lofts and warehouses. Many of these warehouses remain today. The 1944 Wyer Report states that the maximum length of freight cars accepted by the Jay Street Connecting Railroad is 52 feet, however freight cars consigned to or for the private siding must not exceed 42 feet 6 inches, due to the sharp radii of the private sidings. Furthermore, freight cars with six axles (six wheels on each truck / three axle trucks) could not be handled. Upon the closure of Jay Street Terminal, the main railyard and property was purchased by Consolidated Edison (a/k/a ConEd), the electric utility company in the New York City area and is now a transformer switching yard. The New Dock Street Yard is now the Empire Fulton Ferry State Park. 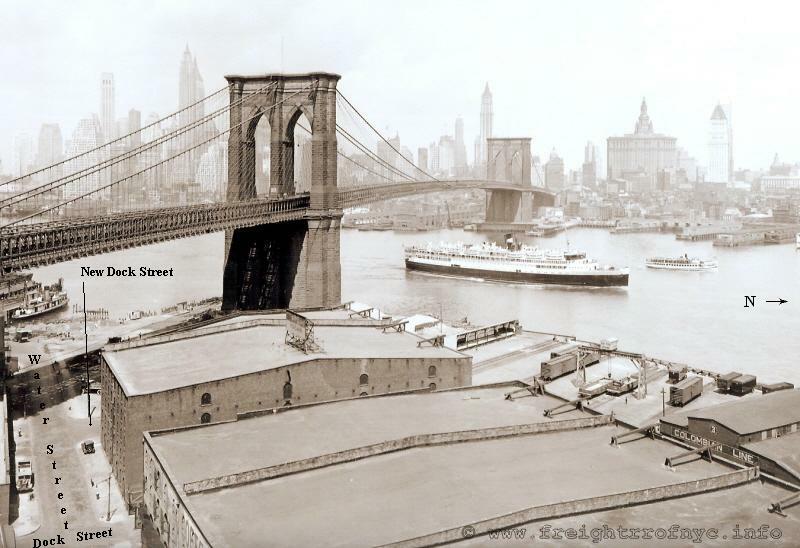 Early images through 1929 of the Jay Street Terminal show a pontoon supported wood Howe Truss float bridge in service. Upon my receipt a few years ago of a 1958 photo of locomotive #7511 (seen below in locomotive chapter), it clearly showed a pony plate girder, so I naturally concluded this was a "simple" pony plate girder float bridge and listed it as such on this page. Boy, was I wrong. 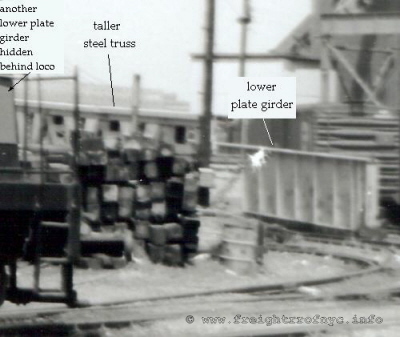 Upon reviewing Tom Flagg's article in Transfer #44 in May 2009; I took note that the girders were of different heights in the 1944 Wyer Report photo. At first I thought, would the cash strapped Jay Street retrofit two steel plate girders in place of the outer wood trusses on the original Howe Truss bridge? While I guess it could be done, Paul Strubeck felt they did not. Recalling the #7511 image in my collection, I immediately "dug it out" and grabbed a magnifying glass. Low & behold, in spite of the image being a little blurry, there was clearly a steel truss down the center of the bridge, which was slightly taller than the outer plate girders. 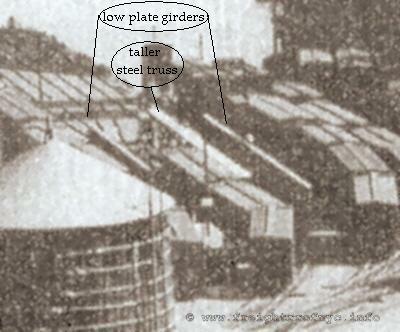 Note the height and thickness of this center girder (compared to the outer girders below) in the bottom two images under the circa 1929 Howe Truss image. This is my first encounter with this type of float bridge, and it is without a doubt quite an unusual design when one is used to either Howe Trusses, or "pure" steel Pony Truss or steel Pony Plate Girder float bridges. This design is a kind of composite of both designs, and for the duration and until this name is corrected, will be called such here. Upon conferring with Joe Roborecky, he feels as I do; that the Jay Street Terminal being such a small operation with limited financial assets, took the cost effective option by retrofitting the original wood Howe Truss float bridge with steel girders and trusses, and retaining the original deck and substructure. Whether this is even feasible from an engineering / construction stand point, I honestly do not know. Logistically speaking, it would appear easier to just "swap out" the float bridge than reconstruct the Howe Truss. In any event, we can safely conclude that the Jay Street Terminal Howe Truss float bridge was either replaced completely or modified to the composite float bridge discuss above. The question remains on what date did this occur? 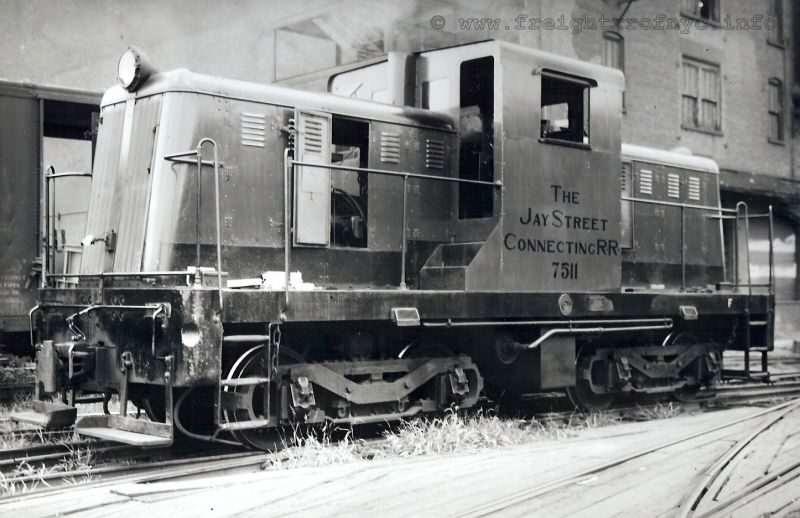 The Jay Street Connecting Railroad would operate until June 27, 1959; and during its existence it would operate an eclectic roster of equipment, with several "one-of-kind" units of demonstrator parentage. In 1910 at the formation of railroad operations, Jay Street Terminal purchased a Baldwin Locomotive Works steam powered sidetank (sloped style) locomotive of 0-6-0T wheel arrangement and was numbered #1. The following year, a second locomotive of almost identical build and would be numbered #2. What with the unsatisfactory performances of primitive internal combustion-electric locomotives tried (#3 in 1913 and #4 in 1916) it appears that these steam locomotives would remain as primary motive power through circa 1930. 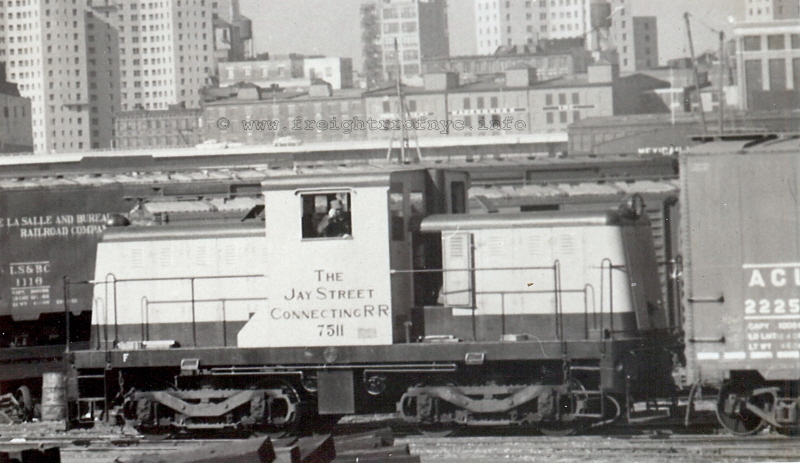 Also at an undetermined date, the Jay Street Terminal would be renamed Jay Street Connecting Railroad and the steam locomotives livery would be changed as such. In 1931, one of these steam locomotives: #1; would be sold to the New York Dock Railway which operated their own terminal not even a mile south. It would be renumbered #41 and that is where it would operate for several more years. Locomotive #2 however was not as fortunate as its sister and would be stored on Jay Street property beginning in 1931, to eventually be scrapped in 1939. To date only one known image is known of the steam locomotives and it is with great enthusiasm, shown below. We are greatly indebted to William Longo, of whom contacted the author. He was seeking permission to use build information for the locomotives in an auction website description, and quite honestly our communication led to the images outright and direct purchase. 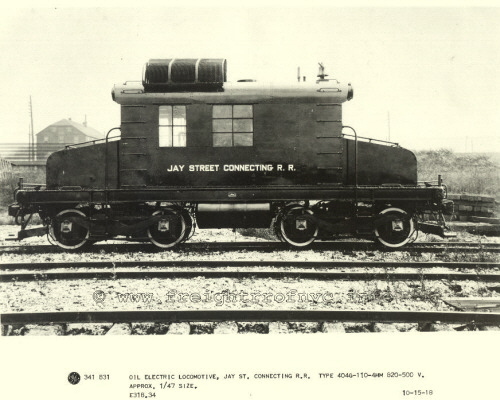 The gas / oil-electric locomotives that would come to replace the steam locomotives of the Jay Street Connecting Railroad operation, had to be the most unique and diverse of the Brooklyn Rail-Marine Terminals, with Jay Street having purchased several experimental / demonstrator locomotives. Locomotive #3 was a center boxcab switcher, and most peculiar in appearance. 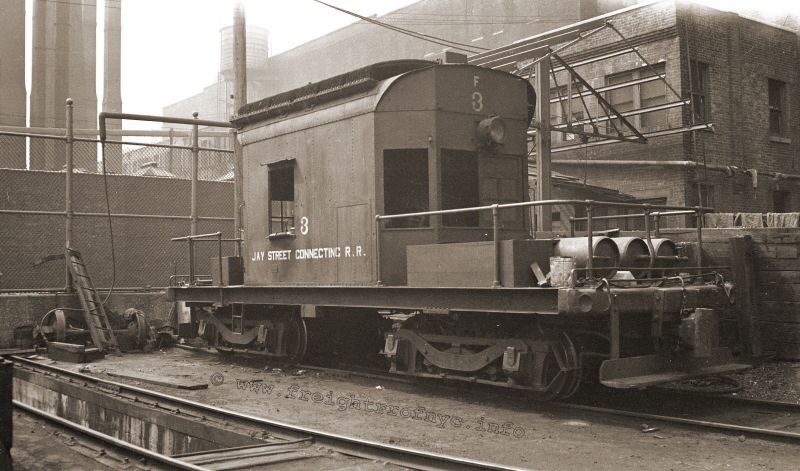 This unit looked more like a shack on a flat car than an actual locomotive, and quite honestly resembled the unpowered Long Island Rail Road float reacher cars or some home shop constructed trolley motors, and with no regard given whatsoever to aesthetics. Its early ownership history is equally as odd, resembling that of a troubled child bouncing from foster home to foster home. The original rating of this locomotive was 175 horsepower and was equipped with 205D traction motors. 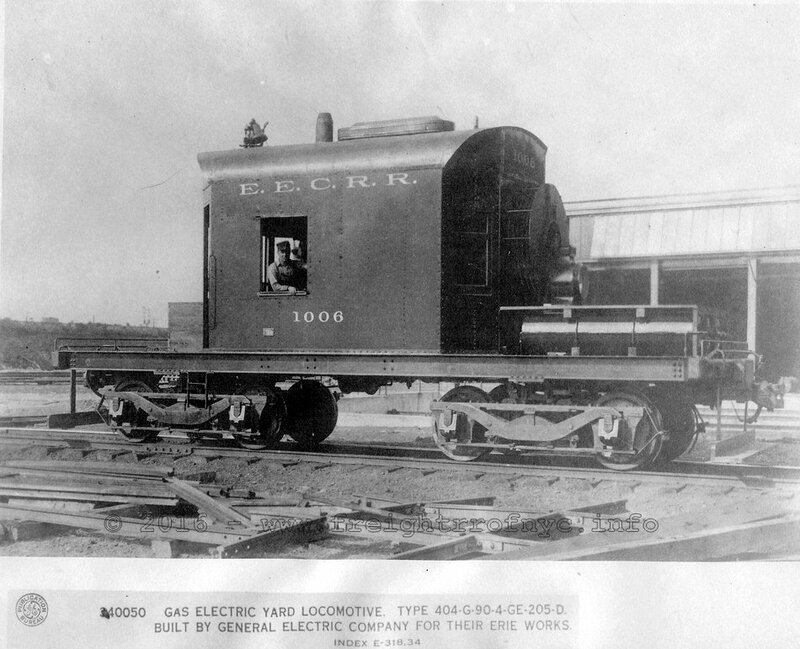 After several years of service on the EEC, #1006 would be sold in September 1916 to Jay Street Connecting Railroad and numbered #3 and was used for actual service as well as in service testing. However in August 1918, 23 months after it was purchased; records indicate that it was returned to General Electric. In October 1918 and after its return to General Electric, this locomotive would be rebuilt with four new HM820A traction motors and the overall weight increased from 45 to 50 tons (some resources state 55 tons). Upon completion of the rebuild, it was renumbered to EEC #11 and then the locomotive would be leased to the US Army in January 1919. 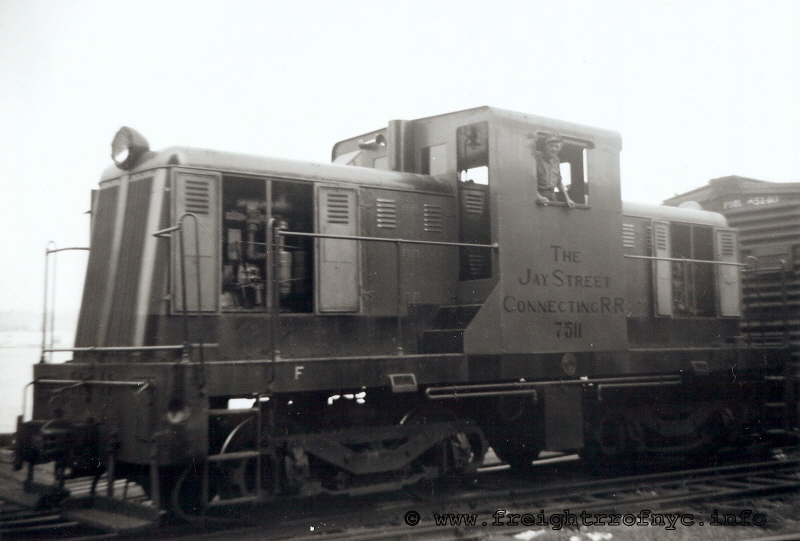 Then in April 1919, the locomotive was sold back to the Jay Street Connecting Railroad, where it regained its original number 3. Hereafter, it would go on to serve Jay Street for many more years. It should be noted at this point, that some sources state that this locomotive was Jay Street Connecting #4. After in depth research, that appears incorrect. It is believed by this author that as both #3 and #4 were GE locomotives, and as both were returned to General Electric for rebuilds during the the same time frame, their histories became entwined and muddled. It has also been stated that allegedly around 1935, #3 would be stripped of its cab and engine, and used as a "reacher car" for the unloading / loading of carfloats. However, photographs below taken after 1935 and as late as 1948 show this unit still equipped with its cab. So at this time, is it obvious that that information is incorrect and most likely the engine and traction motors were removed but not the cab. Furthermore, in what little photos exist of other Jay Street locomotives or operations do not show this float reacher car. 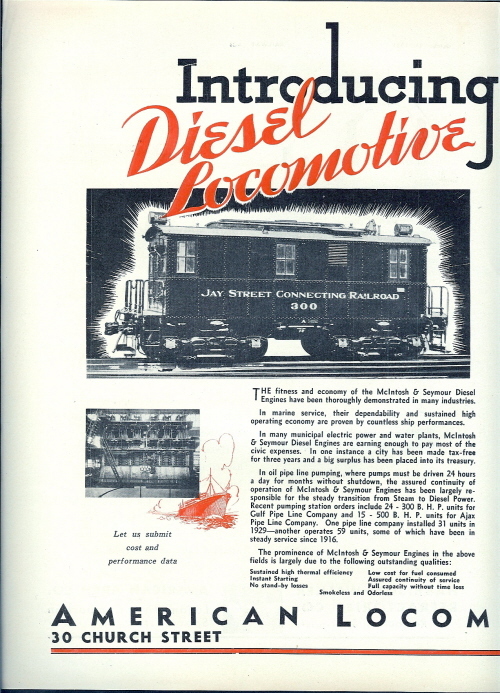 A fact worth noting in regards to both diesel locomotive and Jay Street Connecting history, is that the Jay Street Connecting Railroad purchased the first diesel-electric locomotive to be built and sold commercially. 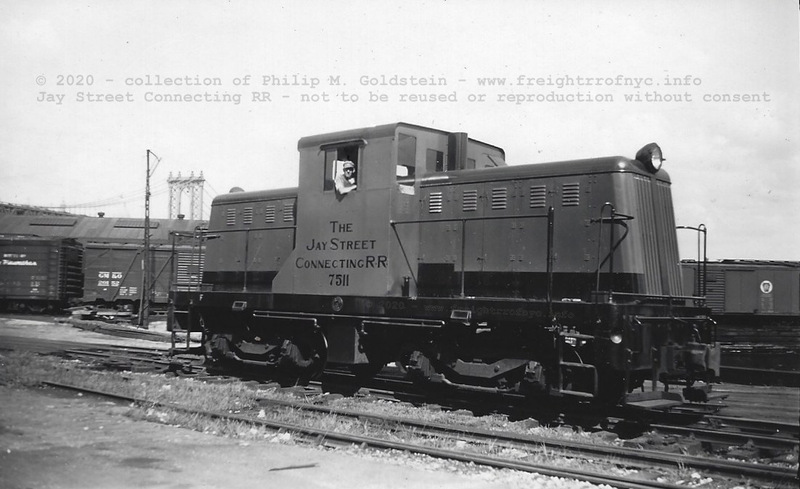 This General Electric locomotive would become Jay Street Connecting Railroad #4 and had the appearance of a "boxy" steeple cab. 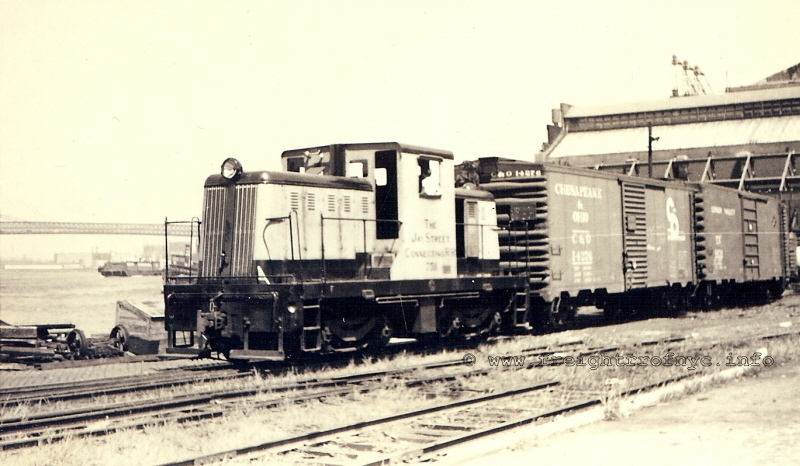 "General Electric produced the first known diesel locomotives in the U.S.A. in 1918. Three machines were constructed, of which one was an armored car for the Army, one was for an unknown industrial user in Baltimore, and one for the Jay Street Connecting. From dates on the builders photos it is believed the Jay Street unit was first of the three. As far as is known, the units were not a commercial success and may have been returned to GE for scrapping shortly after delivery. No positive data on disposition of the units has been obtained however." According to this same reference; the original prime mover for this locomotive was a 200 hp V8 engine designed by Hermann Lemp, Henri Chatain and W. E. VerPlanck of General Electric of which pictures exist of this engine. 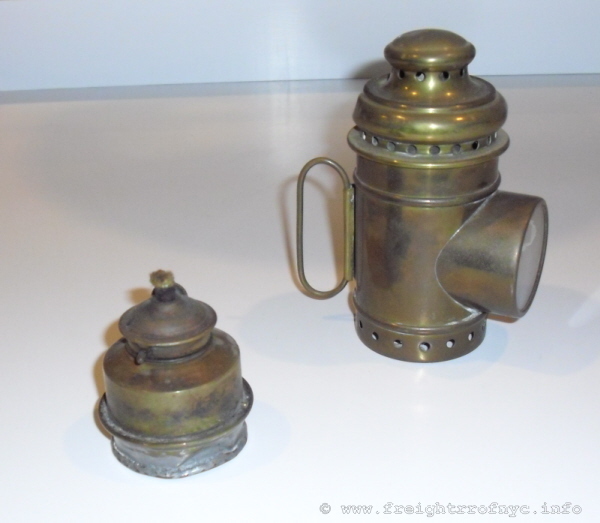 Two cylinders were cast "en bloc" under each of the heads. It appears from the photo of the engine, each of these two cylinders was also "siamesed", meaning that each of the two cylinders shared a common cylinder wall between the cylinders, instead of a hollow cooling passage common of most internal combustion or compression ignition engines. Unfortunately, this unit as built did not meet Jay Street Connecting Railroads expectations, and was returned to General Electric within six months of delivery. While the locomotives' Jay Street Connecting history ends here, the author feels it is pertinent to list its subsequent history for clarification and obviously, historical purposes. The locomotive would be stored for about three years at General Electric where it subsequently repowered with a Sterling "Dolphin" 6 cylinder gasoline engine, and became East Erie Commercial #2 in September 1922. It was used as an experimental unit in developing better control and propulsion systems. In August 1934, the locomotive was partially dismantled. The frame, trucks with original motors and original cab were fitted with new hoods and two 165 hp Waukesha-Hessellman spark ignition oil engines. 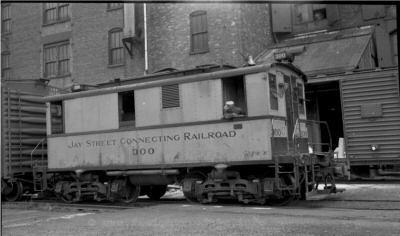 This rebuild was completed April 1936 and the locomotive renumbered once again to EER #11 and new weight 58 tons. 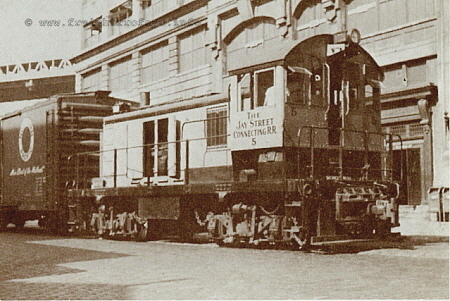 Due to its short tenure on the Jay Street Connecting, only the GE builders photo is known showing the locomotive in Jay Street Connecting livery. However at least one photo of it dated 1937 (following its second rebuild) as East Erie Commercial #11 is known (and can be seen on page 122 of "Centennial Treasury of General Electric Locomotives, Volume 1" by O. M. Kerr).
. 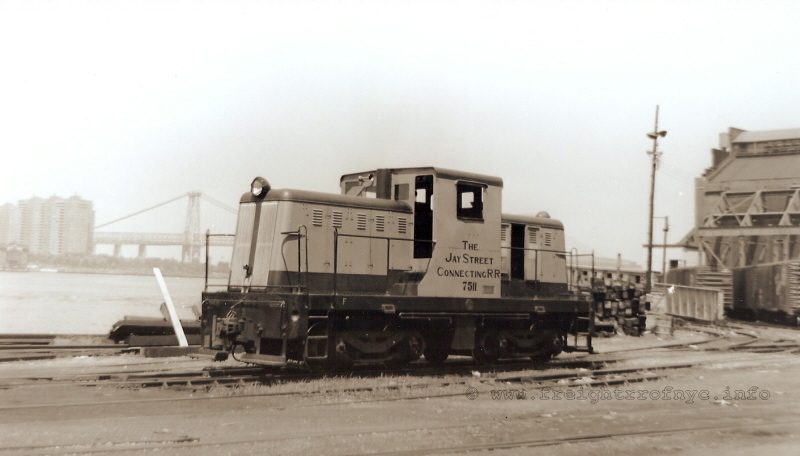 Authors note: In a strange but ironic twist of fate, the fame of being the first to employ the first commercially successful diesel-electric locomotive fell to another of New York's Offline Rail-Marine Terminals. 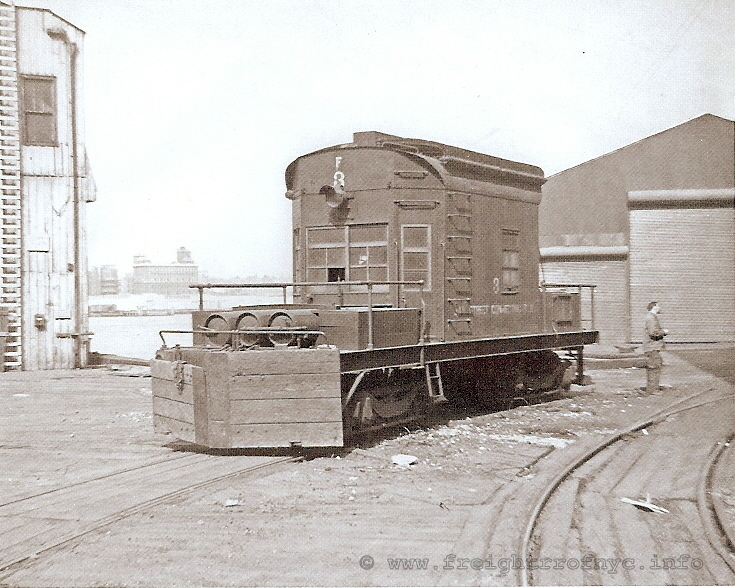 That being a 60 Ton Ingersoll Rand boxcab which served the Central Railroad of New Jersey at their Bronx Terminal on the Harlem River! This locomotive was purchased used and it is an ex-military unit (US Navy - Mare Island #5) and would serve its second owner well until the end of operations. 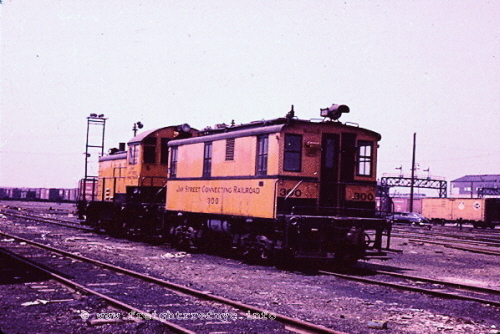 According to Diesel Spotters Guide (Second Edition); this locomotive was a direct successor to boxcab design #300 (below), using the same machinery under hood (although cylinder size is now listed as 9½" bore x 10½" stroke). "On the early units the cab end was regarded as front." This is typical of that era; but as operating practice and locomotive construction throughout the United States has evolved, the locomotive cab is now considered the back of the engine. 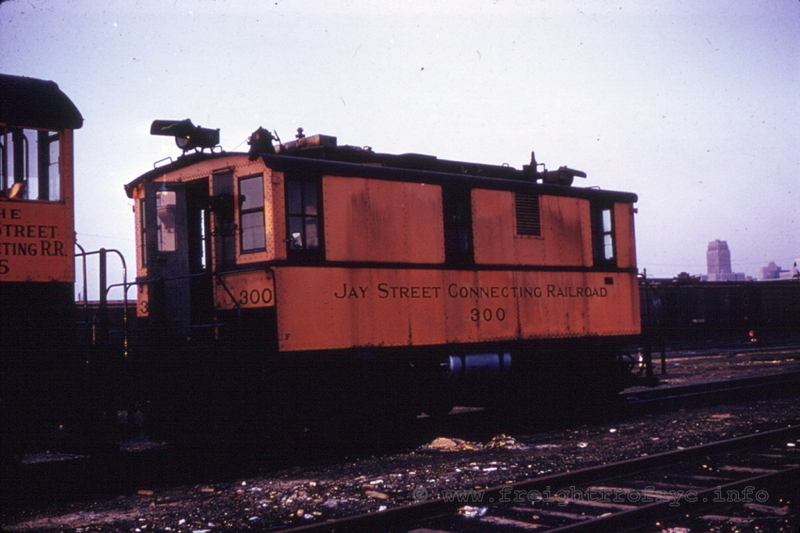 Locomotive #300 was a boxcab switcher in the purest sense, and would also serve the Jay Street Connecting Railroad's operation until the end. It was also built as a demonstrator model, and built by American Locomotive. #300 would be sold to Jay Street Connecting in May of 1931. Specifications refer to this locomotive as a 60 ton 300 hp boxcab. This was the only locomotive of this model built, with the prime mover being recorded as a MacIntosh & Seymour engine with a 9 1/2" bore x 10" stroke. 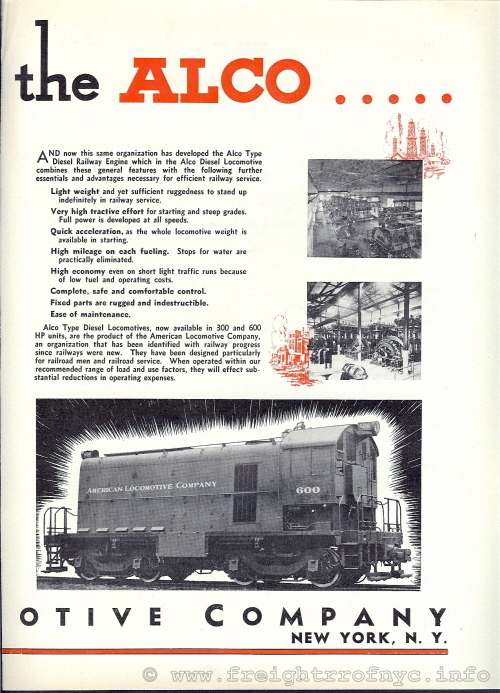 The majority of the cylinder design (with a minor 1/2" variation), would be incorporated into ALCo's 244 and 251 series engines. 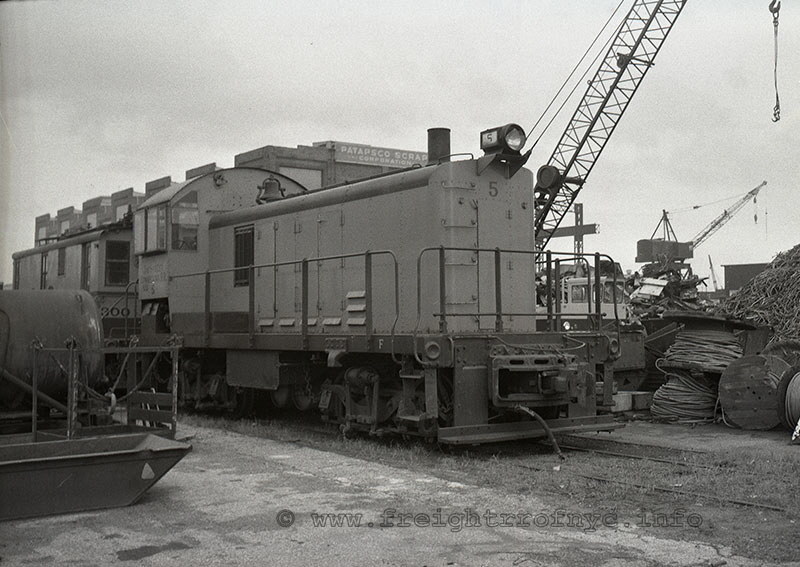 Locomotive #7511, was a Vulcan 60 Ton centercab switcher, similar in appearance to a General Electric 44 ton unit. 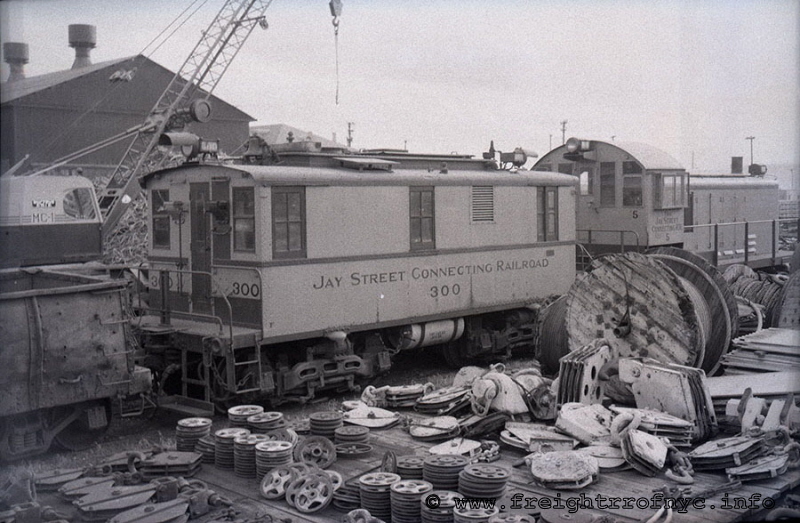 Photographs taken in 1959 after Jay Street Terminal ceased operations, show locomotives #5 and #300 enroute to and at Patapsco Scrap in Maryland; yet #7511 is nowhere to be seen. However a photo of #7511 below, shows it in operation as late as July 1958. It was then learned that this #7511 would be sold to Houdaille Construction Materials (chimney rock quarry) located in Martinsville, NJ. It appears #7511 was scrapped on their property after several years of use. As far as is known, not a single one of Jay Street Connecting Railroads locomotives would survive. This is particularly troubling from a historical standpoint, as several were engineering testaments to the development the sign of things to come: diesel electric locomotives. arrow points to Poto. M. Stasi? Stosi? Note the circular radiator on the cab front of the locomotive. In all subsequent images, the redesigned radiator has been relocated to the roof. In process of being stripped: note three air tanks to right of locomotive. These came off #3. Note locomotive is now painted yellow. Note composite type (plate girder / truss) float bridge to right of loco. #7511 Vulcan 4394 2/1944 std. [a] Built 1913 East Erie Commercial (GE Co. Erie, PA) #1006, may have been built many months earlier than recorded, no supporting documentation remains. Built with one GM16-C6 engine and four 205D motors. Used as demonstrator. Sold 9/1916 Jay Street Terminal #3. Returned 8/1918 rebuilt with four HM-820A motors, and weight increased to 50 tons. Rebuilt < 1935 cab(?) stripped and frame (w/ traction motors) used as a reach car. Completed 4/1936 assigned EECRR #11 when completed. New weight 58 tons. The Jay Street Connecting would also operate various steam powered lighters and tugboats for the movement of carfloats. 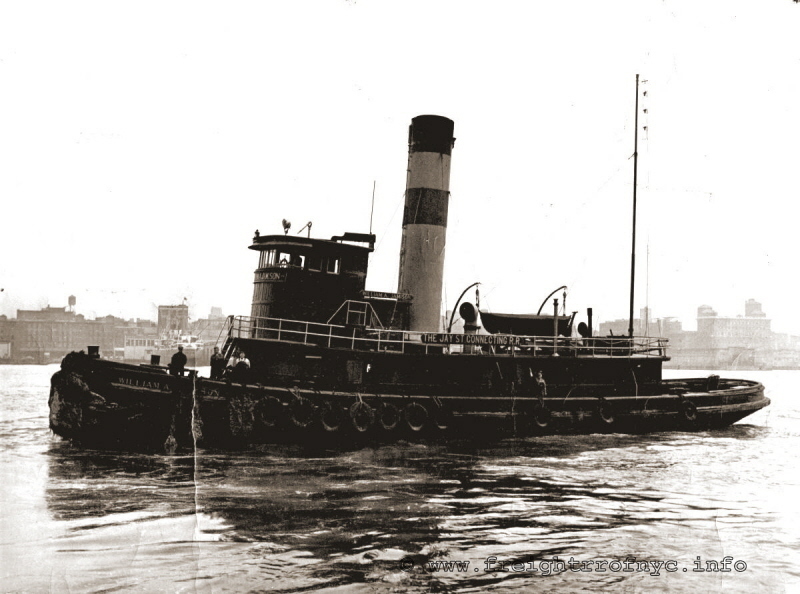 Of those tugboats, the "John A. McCormick" was one of the largest tugboats to have seen service in New York Harbor. This photo was last in a three photo sequence set. See Carfloat 15 below. This photo is first in a three photo sequence set. This photo is second in a three photo sequence set. Boom derrick in tower lifts coal to suspended adjustable chute, discharging in storage pile on shore." (please note: vessels are in order of acquisition). notes: This vessel has a colorful history. 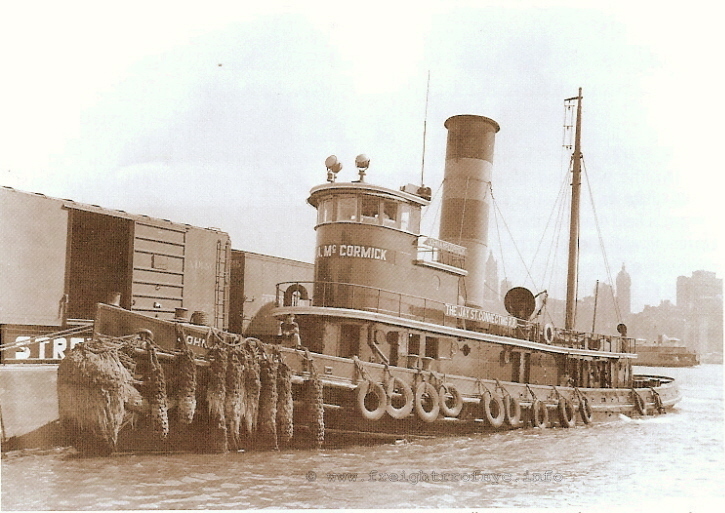 After the war, it then returned to the US, and was sold on unknown date to Great Lakes Dredge & Dock Co. and home ported in Chicago, IL; from about 1920 to 1930. 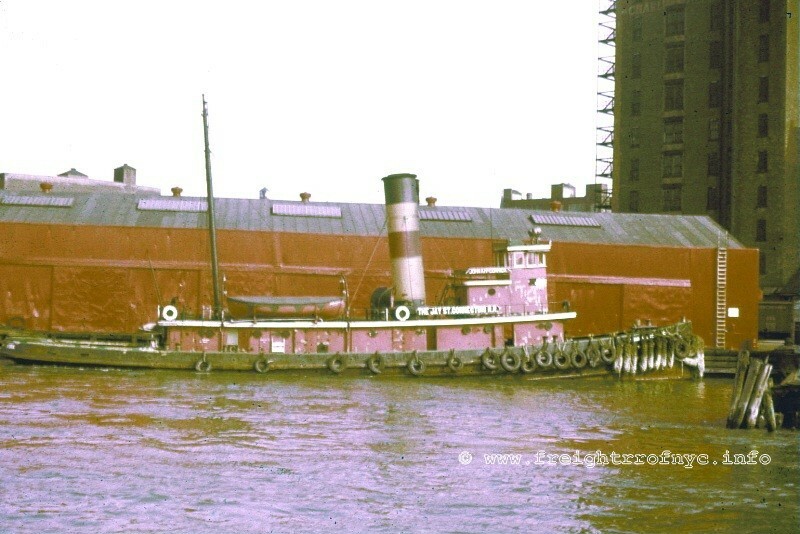 It was at this time of purchase that the vessel is believed to have been renamed John A. McCormick, who was chairman of the board of Great Lakes Dredge & Dock Co.
Circa 1930, the vessel was then sold to Arbuckle Brothers for use at Jay Street Connecting Railroad. As it is understood from Stojiny McCoy, great nephew to John A. McCormick, there is no relation to William McCormick of Jay Street Terminal. Therefore it is believed at this time that Jay Street merely kept the John A. McCormick name that was issued by Great Lakes Dredge & Dock. disposition: sold and repowered as diesel (tugboat? ), renamed East Coast. In service 1965 (Telescope, GLMI 1/1967 issue), According to research by P. F. Strubeck, the East Coast was converted to a trawler in 1960 and off records in 1972. Albert Schmidt was my grandfather and night captain of the tug (William A. Jamison). 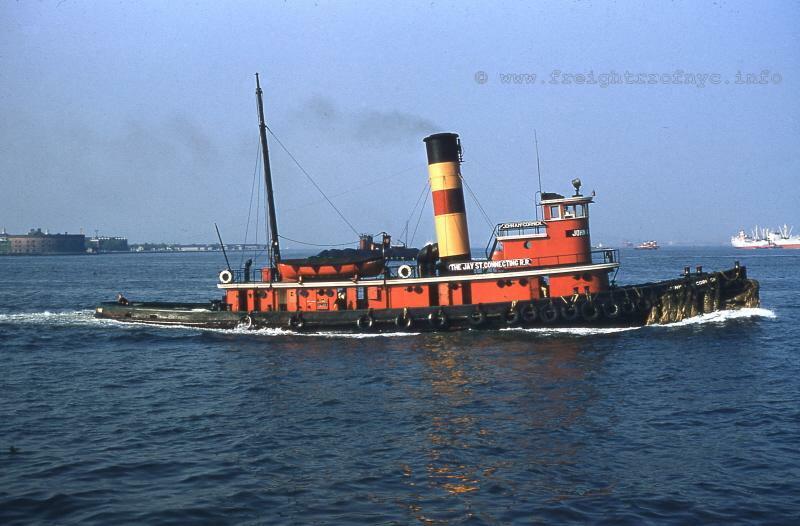 Before being scuttled in the early 1950's (she had no scrap value), the William A. Jamison was the oldest operating tug in the New York City harbor. An electric generator was added at a later date. I recall my grandfather proudly showing the generator to me when I was about 8 or 10 years of age. The call sign on her steam whistle was two long blasts, two short blasts and one long blast. I have no idea of the significance of this code. Rudder control was via chains from the wheel in the wheelhouse to the rudder stock. Interestingly and unusual was the fact that to turn the vessel to port you tuned the wheel to starboard and visa versa. The engine order telegraph consisted of a handle and cable mounted of the forward bulkhead in the wheelhouse. Pulling the handle with the appropriate code (number of pulls) would ring a bell in the engine room. I don't know if this information is useful to your web but I thought you'd find it interesting.